After nearly four years into the Mangrove Reforestation Initiative, one of the three original pilot sites is seeing great success. The initiative began back in December 2010, when Valentine Rosado of Coral Reef Alliance, along with other volunteers, established three areas where Red Mangrove (Rhizophora mangle) propagates (seedlings) were planted using the Riley encasement method. The method encompasses the propagules being encased in a PVC pipe and then securely planted into the area chosen to be reforested. The original areas where the mangroves were planted included a beach property in South Ambergris Caye, along the Boca del Rio beach and in a beach property on Northern Ambergris Caye. While mangroves act as a natural sea wall protecting beaches from erosion, developers often remove them in the effort to create a white sandy beach. However, the deforestation of mangroves only leads to increased coastal erosion, and developers are often obliged to construct temporary concrete cement walls. With the issue of coastal erosion, the best solution seems to be simply reforesting the area with mangroves, but that is no easy feat. According to Rosado, mangrove reforestation is a difficult task that takes time and has a low success rate. “It’s easy to remove the mangroves but replanting them and having them successfully established is a hard task. 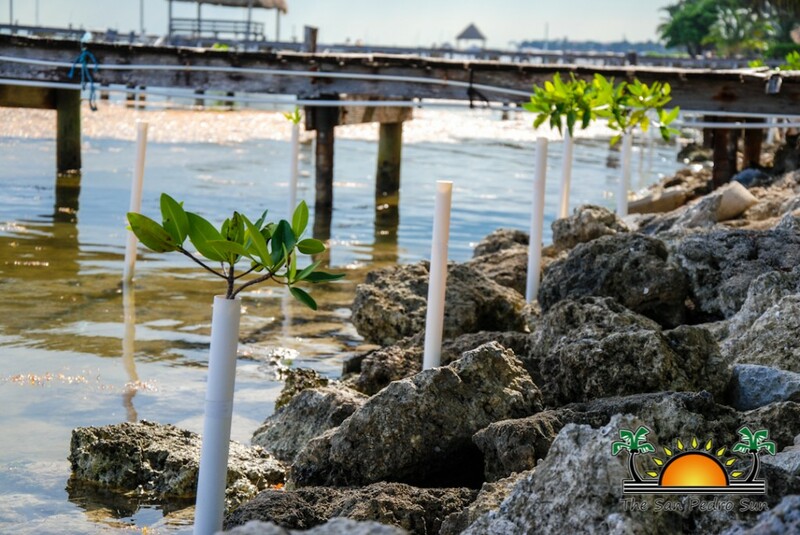 Many have tried to simply plant mangrove propagules on the beach and hope they grow, but there are several factors that reduce the chance of the seedling actually maturing. The propagules are often washed away, or are unhealthy and do not germinate. 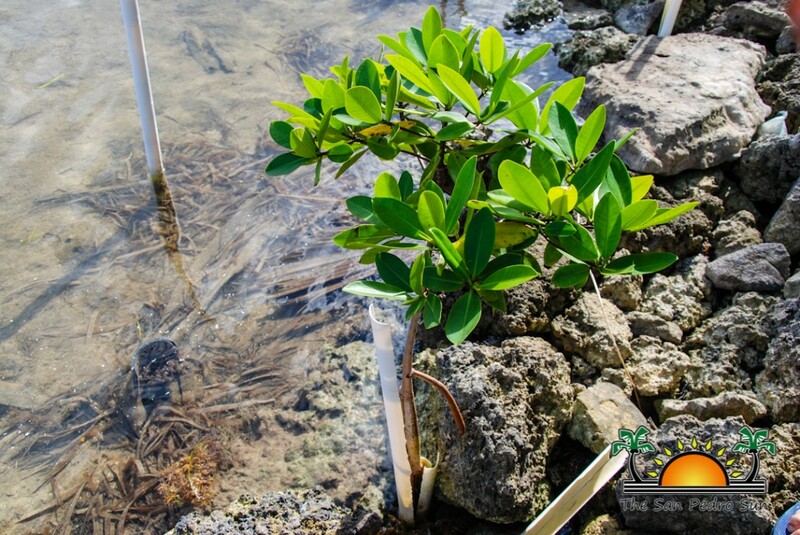 The Riley methodology was developed for the purpose of establishing mangroves along high-energy shorelines where natural recruitment no longer occurs and where conventional planting methods are ineffective. While the Riley method increases the security of the propagules in the area, there are still many other factors that can diminish the chances of it growing,” said Rosado. Out of the three areas, the highest success rate has been identified in the beach property located in Northern Ambergris Caye. The property belongs to Bob and Helen McClain, who have been trying for years to reforest their beach front. Since the McClains originally purchased the property, they have been dealing with erosion problems along the beach due to the fact that the area had no mangroves. 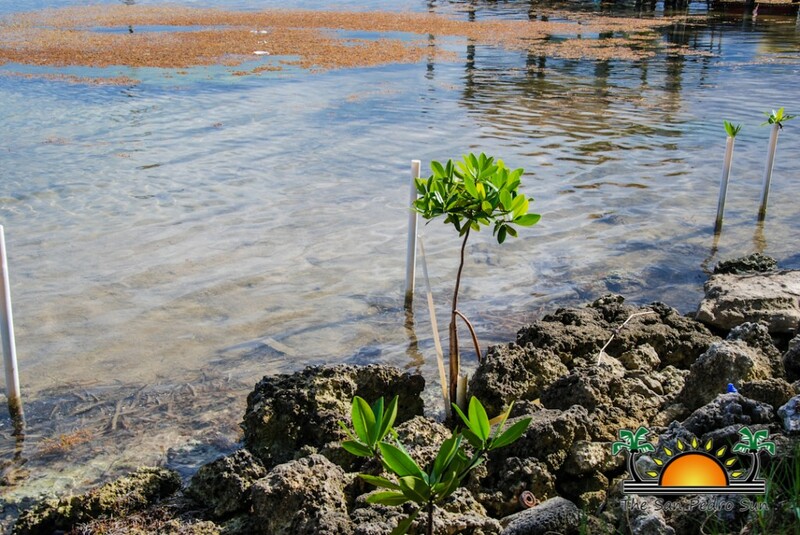 When they heard of the initiative, they eagerly asked to be part of it and have mangrove propagules planted in the beach front of their property. “I have dealt with the erosion and I know what a problem it can be. I think the mangrove is a wonderful and viable solution,” said McClain. Up to date, several propagules have furnished into saplings that are breaking out of their casing. 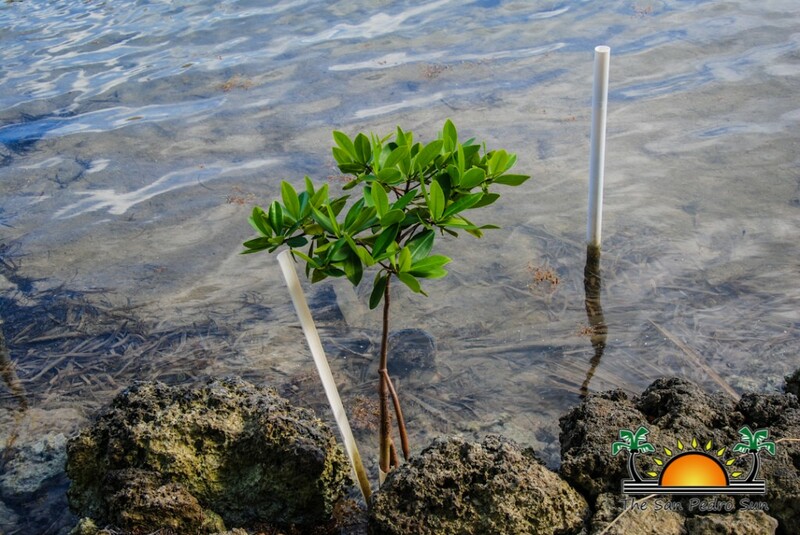 “We are happy to see the green leaves of the mangrove trees coming out of the PVC pipe. We just hope that they reach maturity. Hopefully the mangroves will soon provide habitats for the area’s marine life,” said McClain. At current growth rate, the mangrove saplings in the area are expected to be securely established in the area and begin to develop secondary roots within the next two years. “The presence of mangroves is essential to the survival of our beaches. Without them, we will see rapid beach erosion. Once a mangrove is well established, then it will begin to reproduce on its own and soon the area will once again be resilient. We want to get the local residents to integrate mangroves as part of their coast and even as part of their development. 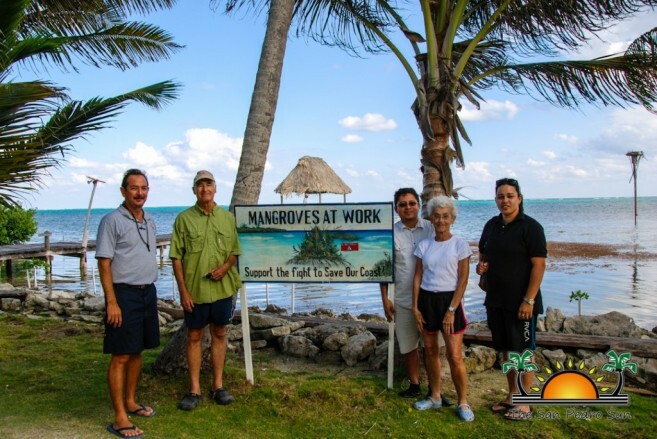 The McClains are one of the few families that have noticed the importance of having mangroves protecting the beaches,” said Rosado. Unfortunately not all residents value the protection mangroves offer, and consider them a nuisance. 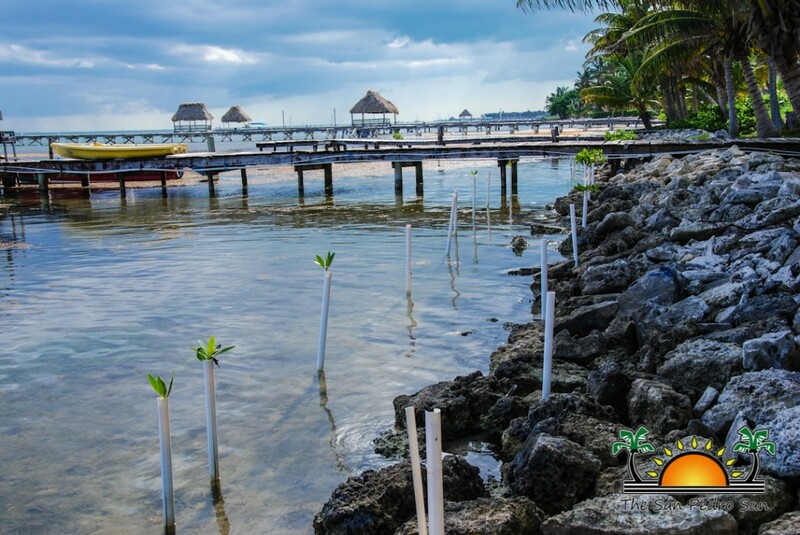 The propagules placed along the Boca del Rio were vandalized, and all seedlings were uprooted from the encasement. “We can try many times to reforest areas, but without public support, it will not be successful. 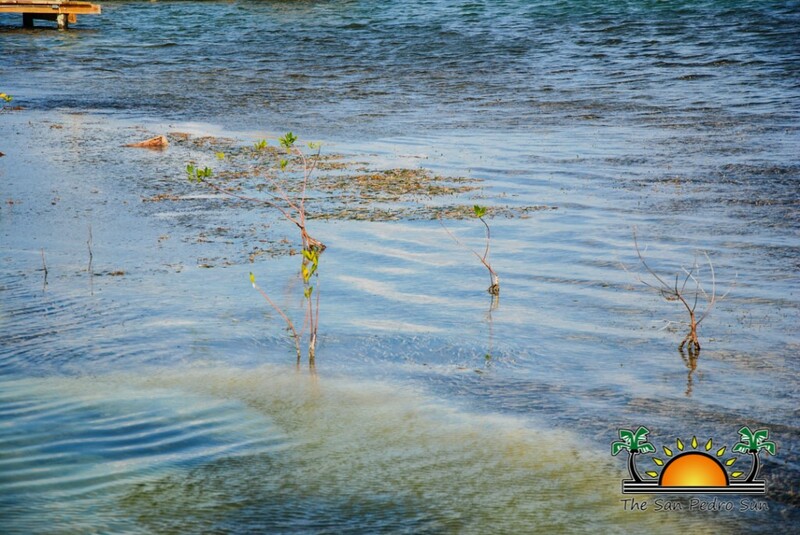 Residents must educate themselves on the importance of mangroves to our environment. 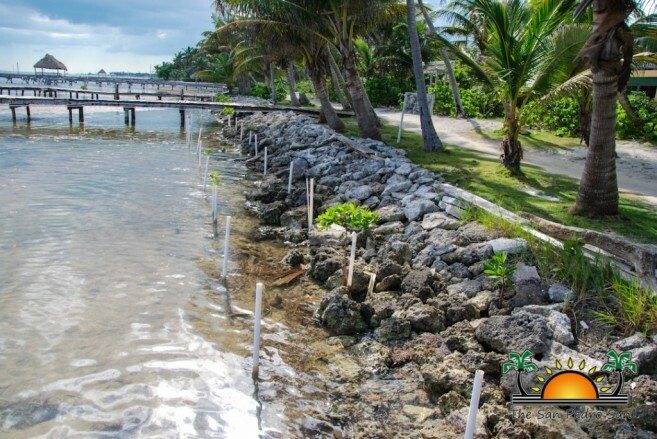 Not only do they prevent erosion, but they also act as a barrier of protection during storms and are habitats for several juvenile marine species,” said Rosado. To learn more about the mangrove reforestation efforts, contact Valentine Rosado at 602-2100. More on mangroves: There are four types of mangroves in Belize: Red (Rhizophora mangle), black (Avicennia germinans), white (Laguncularia racemosa) and Buttonwood (Conocarpus erectus). Mangroves are unique as they are some of the few plant species that grow in salt water. 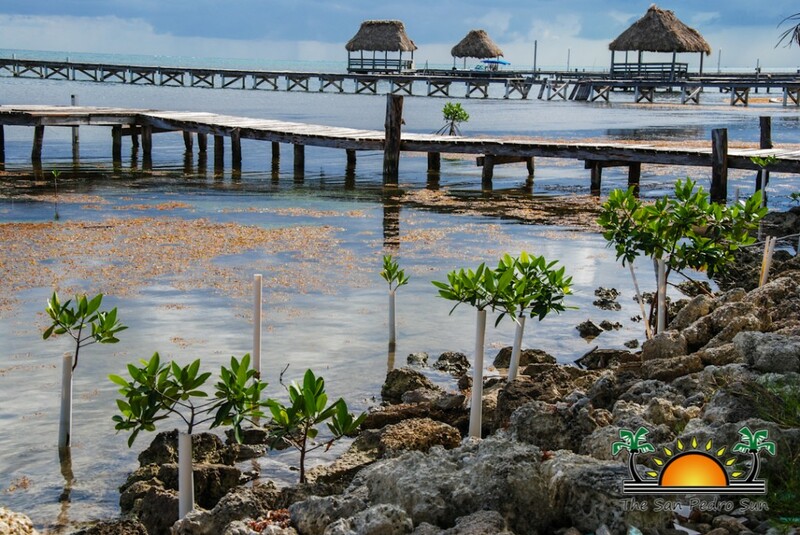 Belize has the highest overall percentage of mangrove cover of any of the Central American countries, but is experiencing a major threat from clearance for development. 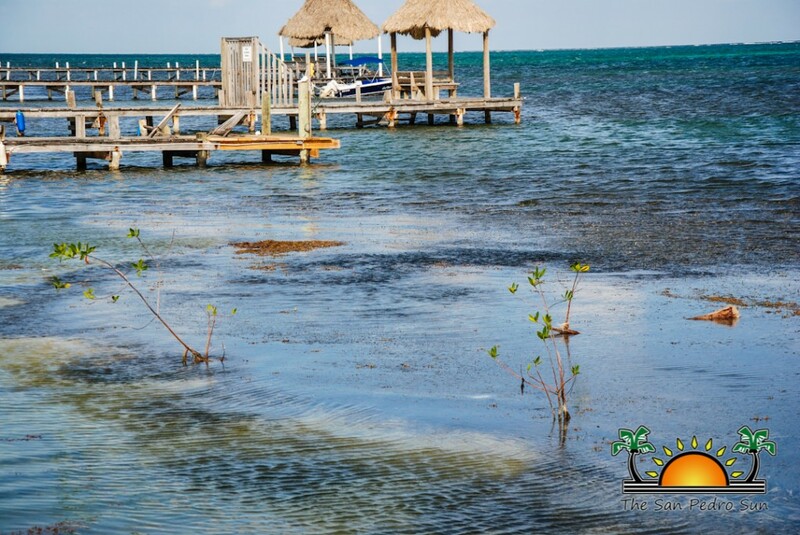 This trend of mangrove deforestation is increasingly apparent in Ambergris Caye as coastal development is increasing year after year. Mangroves are essential to the environment as it provides fish nursery areas, protects coastal regions from erosion and storm surge, keeps coastal soil together, maintains healthy tropical marine ecosystems, provides a nesting and feeding area for birds, provides construction material, firewood, and fuel, and absorbs carbon dioxide from the atmosphere.